Jesus was the most gifted teacher to ever walk on this earth. He had a way of not only teaching those who were listening to learn, but also rebuking those who were listening to critique. 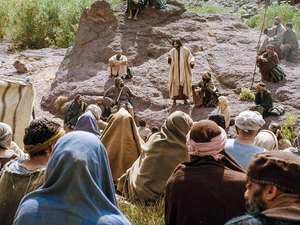 While Jesus was teaching to his disciples, he also knew the crowds were there watching and listening. He is teaching to His disciples, He knows the crowd is listening, and He is rebuking the religious people. All in the same sermon. He knows His audience. He knows who’s listening, who’s learning, who’s watching from afar, and who’s waiting to pounce. Disciple: A learner, one who follows one’s teaching. A disciple was not only a pupil, but an adherent, hence they are spoken of as imitators of their teacher. Jesus recognized that there is a difference between those that are devoted followers and those that are there for a show. I would say much is the same today. Though we may not gather on the side of the mountain, we do gather inside of a building. Some to hear and learn as his devoted followers, others coming to consume and catch a show, and others coming to critique and cast stones. Disciples and crowds still exist today. Are you like the disciples who came to Him? Do you come close to God? Do you follow to glean from His words? To listen, and learn? Do you imitate Christ out of a grateful heart? Are you like the crowd? Watching the show, listening, but never entering in? Listening for error so you can critique and compare? Waiting for spectacular but have yet to come close enough to see Jesus face to face? It’s easy to be a part of the crowd. It’s easier to pretend to follow Christ than it is to actually follow Him. You can blend in, you can seem like you’re a part of the movement, you can play the part. But, it’s much better and more rewarding to step out of the crowd and into relationship. Let’s become a disciple. Not one who plays church or looks the part, but one who is sold out to following Christ. Complete surrender, complete trust, complete pursuit of our Teacher. Let people know us not by the crowd we sit in, but by the One we imitate. Let’s come close to our teacher, let His word change us so our lives display what we believe. 1. Write out some of the differences between a crowd and a disciple. 2. Which do you most associate with? Why? 3. Is it a struggle to follow Christ with everything? Why? Why not?